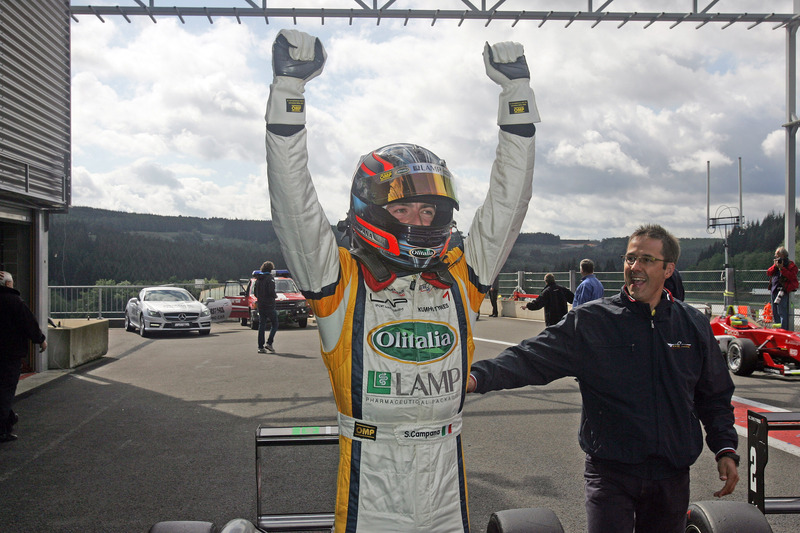 07/08/2011 - Sergio Campana's victory ended the exit out of national borders of the Italian Formula 3 Championship that took place this weekend at the Belgian circuit of Spa-Francorchamps. On the very same track that in three weeks time will house the Formula One World Championship, the Italian driver of BVM-Target showed a supremacy that was never questioned after starting from the second position of the grid (with line-up decided by the top eight grid inversion of qualifying) and overtaking Brandon Maisano thanks to a sprint start. The French team mate started from the pole position on the part of the grid still wet and could not oppose any resistance at the start; he afterwards led a defensive race to keep compact the fight for the podium. The most determined driver of the lot was Maxime Jousse who, overtook his team mate with three laps to the end of the race, completing in this way a whole BVM-Target podium. Raffaele Marciello (Prema Powerteam) obtained the fourth place during the penultimate lap when in the heat of slipstream gaming he managed to beat the rivals; at the back of the 16 years old Swiss ended the Brazilian Victor Guerin (Lucidi Motors) and the Californian Michael Lewis (Prema Powerteam), with the latter scoring the fastest lap of the race in an amazing recovery started from the last position as consequence of a contact with Daniel Mancinelli (RP Motorsport) in the initial stages. Facu Regalia (Team Ghinzani) was only seventh and produced a thrilling duel at the beginning of the race with Maisano for the second place but was then absorbed into the group fighting for the top 3. Eddie Cheever (Lucidi Motors) run an attacking race despite an aching hand after the incident in qualifying that was worth the eighth final position thanks to an overtaking to Edoardo Liberati during the last lap. Team Ghinzani's color bearer left Spa giving away the classification lead that passed to Campana standing now at 75 points and enjoying a 5 points gap to Lewis and 11 to Jousse; Liberati is now fourth 16 points shy the leader and two points clear of Marciello. The Italian Formula 3 Championship will move back to Italy for the next round scheduled in Adria on 4 September.